The Super Soaker XXP 275 is another of Larami Ltd.'s attempts at making a double-barrelled water weapon. 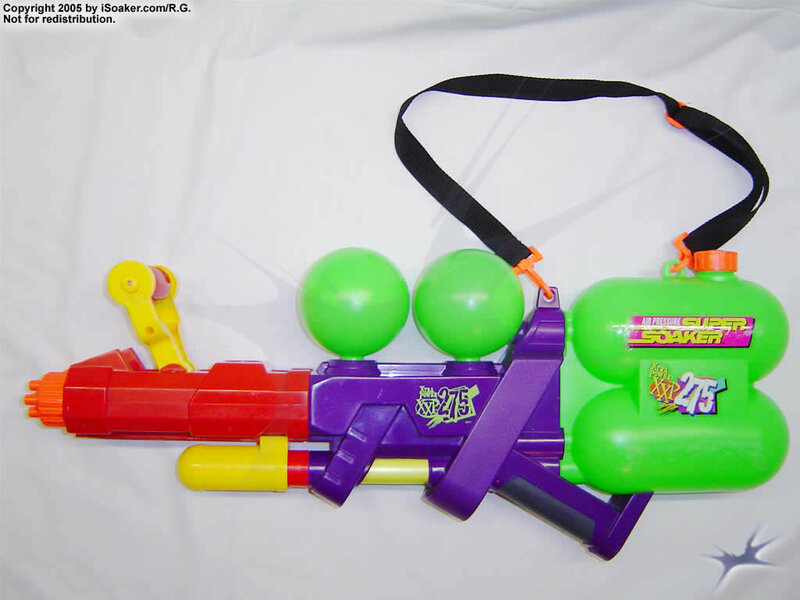 Unlike the Super Soaker XXP 175, the XXP 275 was given a single water reservoir with a cap for easier filling, a shoulder strap for easier carrying and multiple nozzles for a more capable blaster overall. The four nozzle settings are rated 1x, 3x, a fan sweep and a shower head-type spray. Two decent-sized pressure chambers give power to the dual nozzles. The trigger is mounted on the top of the blaster and looks/feels like a lever. The pressure gauge on the top makes it simple to pump and determine how much more pumping is needed to give a sufficient water yield. All these characteristics makes the Super Soaker XXP 275 a decent heavy assault rifle. The main drawback is the fact that this is merely an XP-class weapon and can be outsoaked by basically all CPS-models. The top-mounted trigger mechanism is more fragile than index-finger based triggers and makes it awkward to pump and fire at the same time. Once the big-blaster in the field, the XXP 275 can be out-soaked by more compact CPS-based blasters such as the Super Soaker CPS 1000. Has a shoulder strap for easy carrying and [acks decent power for its size. The tank provides a respectable amount of water considering its rate of fire. 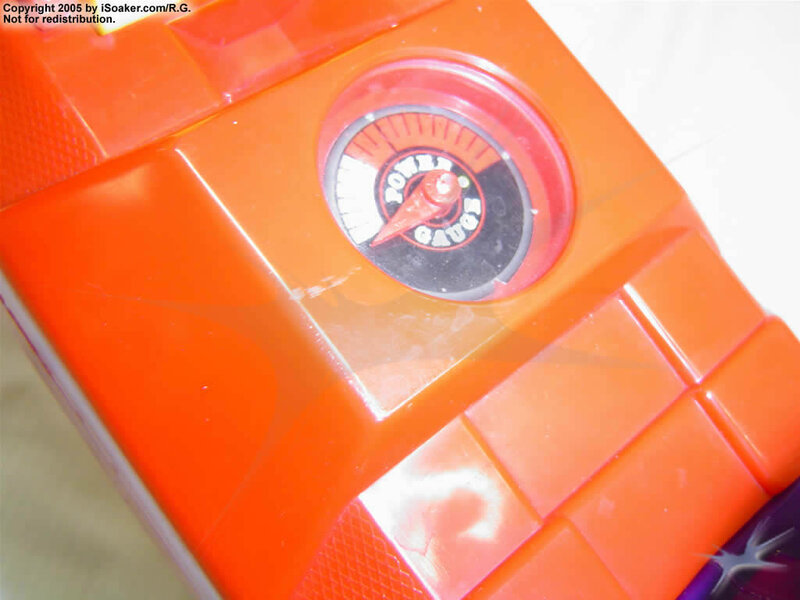 The top-mounted pressure gauge allows the user to easily determine firing chamber pressure without having to tip the blaster on its side unlike the Super Soaker XP 110. Top mounted level trigger is tricky to use, making it not possible to pump and shoot at the same time. Pressure chambers, though about the same size as those on the Super Soaker XP 150, drain quickly due to the two nozzles. Not all nozzles are useful. The XP-class nozzles are outclassed by all of the CPS-line of weapons. The XXP 275 is very much like the Jaguar XJ220, being that when that car came out it was pretty much the fastest craziest supercar ever. It held that feat for about fifteen minutes in which the McLaren F1 was released pretty much making the crowd around the XJ220 disappear. Same with the XXP 275, air pressure reached its peak with two four barrel nozzles with two large powerful air chambers and a large reservoir in which people thought was the top end. Just like the XJ220 though, the CPS 2000 was released minutes later and sparked a whole new wave in powerful devastating water blasters, again leaving the XXP 275 somewhat forgotten. Not as well known maybe, however the XXP 275 really is a great water blaster. The great thing is that unlike the Monster XL it is a large double barrelled water blaster that is a much better option for all out intense water fighting. You could say this is what the Monster XL used to be, before it decided to eat loads and make itself incredibly overweight for its own good. The nozzle choices on both barrels are the same being a Thin Stream for conserving (around 1x each), Thick Stream for a quicker soaking (around 3x each), Flat Spray (a fan nozzle) and Spray Blast (a showerhead). This overall makes for a pretty good choice of nozzles, which you can mix and match for great soaking combinations, enough to make somebody faint anyway. Despite the XXP 275 being air pressure based, thanks to the high power high capacity air chambers it gives off good power which with a good user can be effective even against larger CPS’s, and definitely all the new rubbish out now. Along with this one thing many older larger XP’s had were high pump volumes with tracked pumps, and the XXP 275 is no exception. Even with pre-pumping air into the chambers, the amount of pumps (10-14) is very few to full pressure indicated by the well placed power gauge in the middle of the blaster toward the front. For such a large firing chamber too it is very impressive. The colours are nice too and make the blaster look very intimidating; a strap thrown in too is a must. It is basically the result of what would happen if you threw two XP 250’s at each other, and that blaster didn’t look bad at all. One drawback is that we have ye olde lever style trigger instead of the standard push back with your finger ones found on the more modern blasters. Back in the time of the XXP 275 lever triggers while not being around much longer were still there, so in terms of technology the XXP 275 in terms of pulling the trigger was more like coal in a steam engine to power it. You have to use both hands to fire it which makes things a bit more awkward, but given the devastation this can cause it is not a massive drawback. Another slight annoyance is that there is no handle, so filling is also a bit awkward as well. It also leaks a little, well mine does anyway, and even so it is not that bad. It is not as if it has been stabbed and is leaking all over the place, and your opponents will get much wetter. There is also no off setting, so you’ll always be firing two nozzles, although then again at least unlike the XL it does not take all day to re-pump in which by that time everybody has left. The XXP 275 is a great blaster for what it is and is very underrated. While not being a CPS, it still has the soakage and power to be competitive. Despite the slight awkwardness of a lever trigger, with a little time it can be very effective. And who can say no to something with dual four barrelled nozzles, your opponents would think twice about that, and unlike the Monster XL the 275 is way more useful due to the fact it is so much lighter and you can actually run around with it without fear of squashing yourself. If you see one and are a fan/collector/user then pick it up. Doesn’t cost that much however in recent times the price has gone up. Right, now I’m off for a drink. Pretty much all air pressure blasters are approachable as well as some of the smaller CPS’s like the 1000/1200/2100 if you know what you are doing. Anything bigger then make sure you know your stuff and have your specs on properly. Be careful. The XXP 275 has a big soakage for its size back by good power. Along with that it doesn’t take long to fully load it. Higher XP’s and CPS blasters are recommended. Then just be nimble and try to overpower the user. CPS 1500’s and bigger should have less trouble. The XXP 275 is a medium-large sized soaker, released 1996. Its specialties are its sokage and dual nozzle. It can go head to head against even small-medium sized CPS weapons and probbaly has the highest sokage among all Air Pressure Soakers. The XXP 275 is the Largest one piece Air Pressure sokaer and the 2nd largest overall Air Pressure Soaker after the CLASSIC 300/XP 300. These qualities make the XXP 275 the hight of air Pressure soakers and very popular among many Water Warriors and Collectors.